Welcome to the best website for writing homework, assignments, essays, projects and case studies for college and university students. 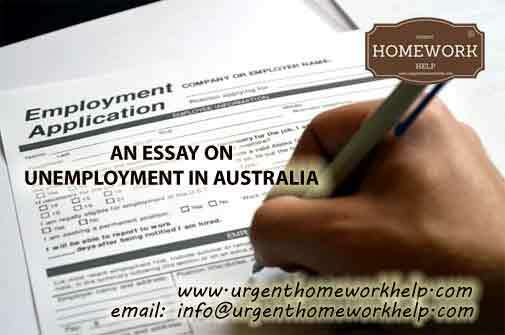 If you are looking for help with your essay on unemployment in Australia, you are in the right place. Go ahead and continue reading. If you would rather have one of our experts write a customized essay for you on any other topic, simply get in touch with us. We are available on live chat and email 24 hours a day. Our email id is info@urgenthomeworkhelp.com. Drop us an email with details of your case study or assignment and one of us will get in touch with you within a few minutes. If you are really short of time, and almost at the point of missing your case-study, assignment, homework, dissertation or essay submission deadline, we can even write it for you and deliver it within 24 hours. 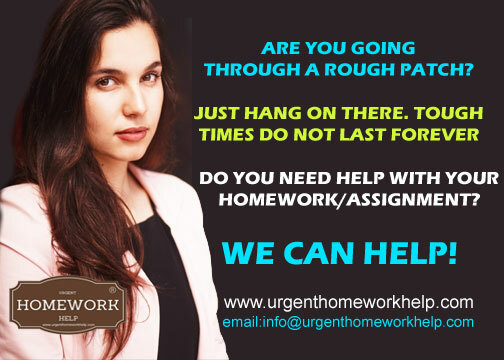 Check our 24 hour homework help service for more details. We are only a ping or email away and ready to help you. We guarantee to deliver high-quality, well-written, original work, 100% plagiarism-free and always delivered on time. Australia, one of the largest and wealthiest countries in the world is also among the most prosperous and steady economies. The Australian economy is of the mixed type dominated by the service sector which contributes more than 60 per cent of the GDP. Naturally thus, the service sector is the top job provider in the country; employing nearly 80 per cent of the labor force. Manufacturing, mining and agriculture are the other important contributors to the economy. The unemployment rate in the country has shown a downward trend since the last five years indicating a robust resurgence in the jobs market. The current unemployment rate stands at 5.3 per cent as against the global rate of 5.5 per cent. Some leading economists and policy makers believe that Australia will achieve near full employment when this rate falls to the level of 5 per cent. Happy picture, one might believe, but the number of new jobs created shows a contrasting image. The Australian Bureau of Statistics states that a total of 12,000 new jobs were created in the month of May 2018, well below the expected figure of 18,000. Some top employment websites indicate that there are more than 1.4 million vacancies across different sectors. Also, the number of new active job seekers has increased manifold in the last few years, with more women and senior citizens looking for full time employment than ever before. Now considering this coupled with the number of fresh graduates entering the employment market every year, it becomes quite clear that the unemployment problem in the country is much more complex than it appears prima facie. Given below is a compilation of a few general contributing factors that are causing this turmoil in the Australian employment scenario. A large number of manufacturing units and industries are either going out of business or downsizing across the country, thereby putting thousands of workers out of their jobs. A lack of other or similar industries in some states, for example South Australia, makes the situation even worse as the outgoing workforce cannot be absorbed elsewhere. Add to this the tremendous advancement in technology which brings into play another very important factor: automation. Like all other developed economies of the world, Australian industries are embracing technology without batting an eyelid. Every major manufacturer now uses robots in the production and assembly lines, thus reducing the need for manual work. This directly impacts the wage earners with little skill set. Robots are slowly but surely gnawing away at their jobs, leaving them looking at other avenues with a sense of insecurity about the future opportunities. We also see arguments that technology and automation creates new employment avenues; what with the need for maintenance, service, creating new software, programs and what not, to keep the automated system running and evolving. But the thing to remember here is that all this jobs need employees/ creators with special skills and education whereas the debate is about the future of the wage earners with little or no such skills. A lot of manufacturing industries which had units here have for long been moving out to other countries which offer cheaper labor costs and tax incentives, among many other sops to Australian and other multinational and companies. Examples of companies completely shutting down their units and leaving thousands unemployed in the process are aplenty. This has lead to a large number manufacturing sector workers stranded with skills no longer useful for future employment. The service sector of the nation is as a result, under huge pressure to provide training and employment to those workers who were previously in a totally different industry. The skills lost or rendered useless in the process of such transformation is again putting the economy under a lot of pressure amidst protests against government policies. Australia has not seen a nationwide economic recession since 1991. Even though the global recession of late 2000s did have an impact on Australia too, never did it become alarmingly high for the local economy. Jobs were lost during the period never the less and it will take some building back on part of the affected industries along with necessary government aid wherever possible. In the meantime the government has to make sure that the lost jobs are not completely swept away and affected employees are kept in the loop with proper assistance. This is a topic of hot debates in the country right now. People feel that a lot of jobs are being taken up by immigrants thus leaving Australian nationals with far less opportunities. Now if the visa policies are eased further for immigrants and more workforces is added to the population, people fear more jobs would be lost to the new entrants. The policy makers need to be very careful before taking any decision here as it has the potential to lead to political, economic and cultural chaos in the country. Slowdown in infrastructure spending with few new or ongoing projects has led to the migration of engineers in various states. Many of them have moved out of the country in search of better employment and opportunities. Seasonal employment is also an area of concern as many jobs are cut off during the off seasons. Although seasonal employment peaks during the summer, most of the workers engaged in such jobs are underemployed rest of the year. Natural calamities affect the coastal areas of Queensland and some other states. These regions with engagements mainly in the agriculture sector are constantly under threat of cyclones and typhoons. A lot of time and labor is lost causing virtual unemployment for the people. The Reserve Bank of Australia has forecasted that the unemployment rate will hover around 5.4 per cent by the end of 2020 and will settle at around 5.3 per cent in 2018. These figures are still way off the target rate of 5 per cent. Many economists and watchdogs are not convinced by these predictions and remain skeptic about the future of the labor market. With the new government settling in, it is curious times to wait and see what policies and amendments take shape to bolster the economy in general and the unemployment issue in specific. We never compromise on quality-our own in-house quality assurance(QA) team makes sure that we deliver only high-quality, 100% plagiarism-free content. Placing an order for customized essay writing help is as simple as sending us the essay details using the ORDER NOW form provided in this page, on the right. Just fill in your contact details, add any additional information and attached relevant reference documents, if any, and send it to us. We will review it and contact you right away. It is really that simple! Chat with us 24x7, right here, on our website and tell us exactly what you need and when. Get real time updates about your assigments we are working on. Share any relevant documentation. Tell us if you would like us to follow any particular referencing style. Specify the word-count for your essay. We like to keep things simple and straight-forward. No complicated processes or extended wait times. No need to chase us for status updates - we will keep you updated on progress at every stage. No surprise delays or price-hikes. No putting up with rude and arrogant customer care executives. We are absolutely committed to delivering your completed college or university essay on time. Thank you for the great essay on unemployment in Australia. My professor simply loved it! I want to make sure the same expert does my next assignment as well. The topic sounded so boring-Unemployment in Australia. Fortunately for me, I found your website and your expert did an awesome job. I had to submit my essay on Unemployment in Australia in less than 24 hours and I was totally out of time. Then I found your website-your expert delivered my case study in less than 8 hours and saved my day!